As we get older and even for the young it is important to always keep our heart health in mind. A heart beats anywhere from 80,000 to 100,00 beats a day as it works to pump oxygen-rich blood throughout the body. It is essential to life and we should treat it as such, which means maintaining low counts of bad cholesterol. Studies have shown that a bowl of Cheerios a day can help lower cholesterol. Additionally, Cheerios are full of fiber, which in addition to helping the heart also helps regulate the digestive system. You can find all the wonderful benefits of this tasty cereal at Cheerios.ca. 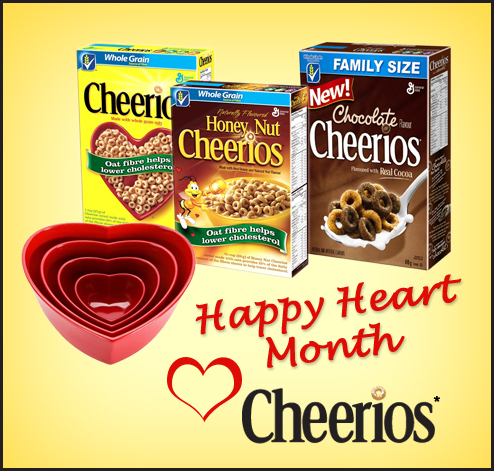 Cheerios would love to give away The Cheerios Giveaway kit to one lucky winner from Canada .Valued at approximately $50,it includes: a set of four heart shaped bowls, Cheerios, Honey Nut Cheerios, and the brand new family sized Chocolate Cheerios.A random draw will be held by Random.org on March 1, 2012 from all entries received. Please share a heart health tip and leave your email. Always start the day with a healthy breakfast. My heart healthy tip is to eat fish at least once/week. Fish is rich in omega fatty acids which are essential for cardiovascular health. Get plenty of exercise and/or try to get a daily walk. A heart health tip I have is to bake,instead of deep frying everything! Eat lots of veggies, whole grains, beans and legumes and fruit. My heart health tip is to get plenty of rest at night and eat a good breakfast. My tip: Add ground flax to your cereal/yogurt. it's an easy way to increase the fibre in your diet without making to make much change! Walk everyday and take the stairs instead of elevators..
My tip is drink a glass of water first thing in the morning as opposed to instantly going for the coffee. The water helps wake all your organs up and get them functioning properly for the day! My health heart tip: Nothing is bad for you, in MODERATION. You don't have to go to extreme's to be healthy, just be smart. Eat Cheerios, lol. Eat fish or take an Omega 3 supplement. My biggest health tip is to get a lot of sleep, did you know it can cause being overweight and heart attacks? I was shocked when I found out a few years back! Get up and start moving! Exercise at least 4 times a week for 30 minutes. I signed up as a email subscriber. Add exercise to every day. Whether a yoga class, a workout at the gym or a walk around the neighborhood, keeping your body moving is wonderful for your heart.